While hundreds of thousands of federal workers will have to wait for back pay after the government shutdown ends, thousands more whose pay comes from federal contracts have little hope of recouping the pay they lose when the government isn't operating. Some contractors are turning to other means to make up for the lost income, like taking extra shifts at a second job. Julie Burr, an administrative assistant for the Department of Transportation in Kansas City, said she doesn't expect any compensation for the time she's been out of work during the shutdown and that she can't even get paid for the two weeks before it started because there's no one to process her time sheet. "I'm just trying to take one day at a time honestly," Burr said in a phone interview. "I keep turning on the news and think maybe today's the day something will happen." She said she's taken extra shifts in her side job as a seasonal employee at Barnes and Noble but it only makes up 25 percent of what her normal pay would be and she's had to ask for an extension on her rent payment, which was due on the first of the month. Burr even set up a GoFundMe page to try and help with some of the expenses and is concerned that even if she can set up a payment plan it could hurt her credit score. "I'm a single mom ... we aren't a two income family or anything. It's just me, and I'm kind of trying to make things meet and if it comes to the point of selling items in the house I'll do that," she said. During previous government shutdowns, Congress has passed resolutions approving back pay for most federal workers. But contract workers like custodians and security officers, whose hourly wages are funded by private companies, don’t get paid unless they work. According to 32BJ SEIU, that means sudden unemployment with no end in sight for the 370 Smithsonian security officers in Washington D.C. protecting the popular museums – which house everything from Judy Garland’s ruby red slippers from “The Wizard of Oz” to Charles Lindbergh’s Spirit of St. Louis airplane – as well as the 50 security officers who work for Smithsonian museums in New York. 32BJ SEIU is a large property service workers’ union that estimates some 2,000 of its members are facing potential paycheck disruptions as a result of the shutdown, including some 70 custodians at the Agriculture Department alone. 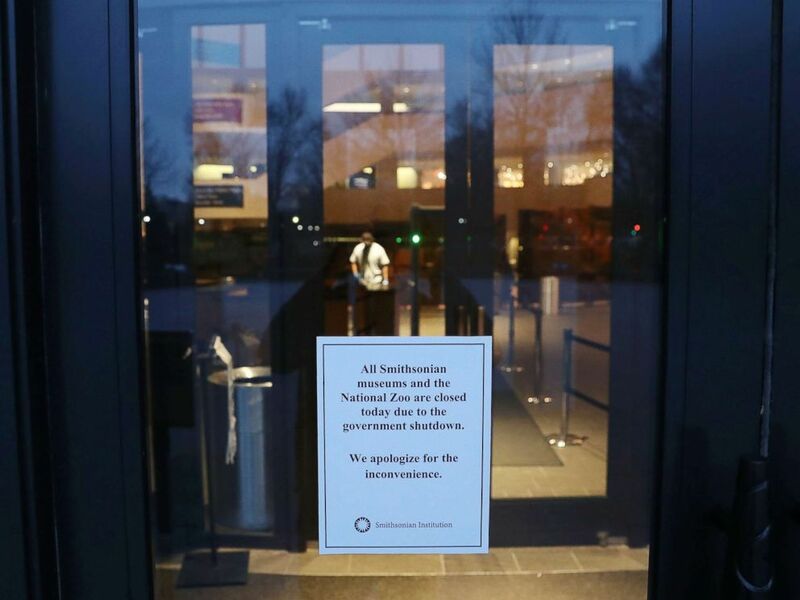 A sign on the door of The National Museum of the American Indian states that the museum is closed as the partial shutdown of the U.S. government goes into the 12th day, Jan. 2, 2019 in Washington, DC. Most of those workers aren't eligible for back pay because they are paid by private companies with government contracts instead of being government employees. It’s a particularly ironic twist for federal workers caught in the showdown between President Donald Trump and congressional Democrats over funding for a border wall. The union said that almost of all of its members are African-American or Latino and many don’t support Trump’s efforts to build a border wall. “A true focus on America would mean support for the hard-working men and women who keep our government safe, clean and running every day while supporting their own families and communities across the country,” said Jaime Contreras, a 32BJ SEIU vice president, in a statement. 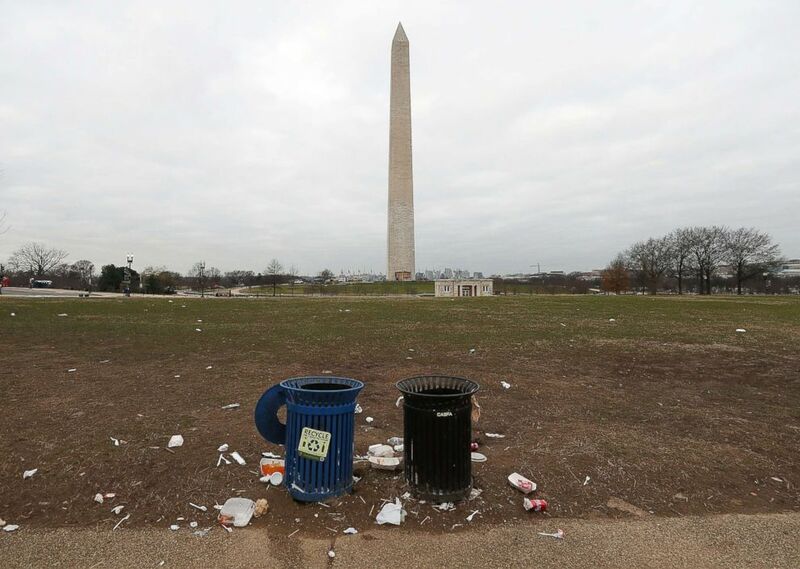 Trash lays on the grounds of the National Mall as the partial shutdown of the U.S. government goes into the 12th day, Jan. 2, 2019, in Washington, D.C.
Burr said she is not a Trump supporter and doesn't support a physical wall, but she does support border security to stop drugs and other illegal activity from entering the country. "I wish everybody would just sit down and come to a compromise," she said.